A disruption is not sufficiently described by the success of some. Others must fail. Last fall I introduced the “vector space” model of visualizing vendor performance. 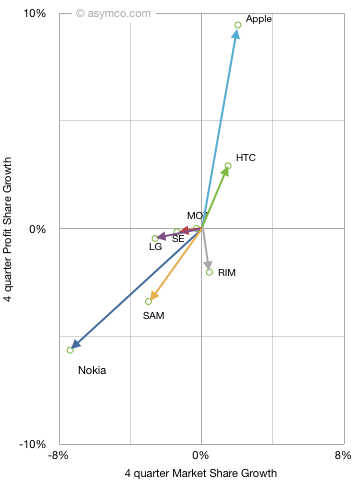 It shows performance along two dimensions: market share growth vs. profit share growth for a set of competitors. One way to interpret this is movement toward the upper right is positive while movement down or to the left is negative. A deeper meaning can be obtained from noting that the vector sum or “net” of vertical and horizontal data points should be zero (i.e. the gains in share should be at the expense of losses in share). 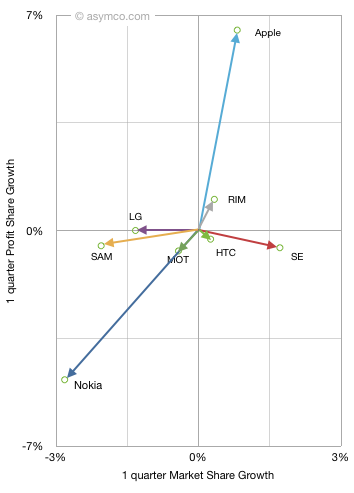 In terms of phone market share the “net” is not zero as “others” are excluded, but the difference is visually not perceivable. Since we’re dealing with share, one way to interpret the data is that “improvement” in one’s position is offset by the “decline” in another’s. We cannot ascribe the benefit of a vendor directly to the loss of another but overall net gainers are offset by net losers. It’s very rare to have a company lose market share while gaining profit share or to gain market share and lose profit share. This implies that in this market one does not trade off volume for profit. The correlation between profit and volume growth is very telling. 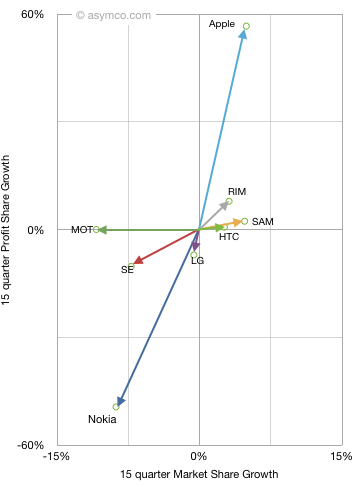 As is the consistent clustering of winners and losers. This analysis demonstrates the shift in the industry is not a short term phenomenon but a disruptive changing of the guard. If history is any guide, this change is not going to be undone.